OKLAHOMA CITY (AP) – Oklahoma’s newly elected State Treasurer Randy McDaniel is getting an early jump on his new job. Gov. Mary Fallin announced Thursday she’s appointing McDaniel to the post, effective Tuesday. 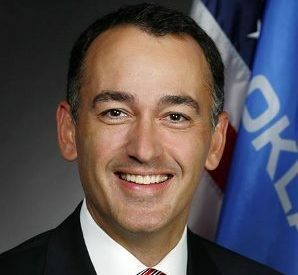 McDaniel was appointed to fill the unexpired term of outgoing Treasurer Ken Miller, who is resigning early to take a position with OGE Energy Corp.
McDaniel is a former Republican legislator from Edmond and was elected treasurer with 72 percent of the vote. He’ll be sworn into office on Wednesday and finish the remaining two weeks of Miller’s term. McDaniel will then take the oath of office again on January 14th during the inaugural ceremony with the Governor-elect Kevin Stitt and other elected officials.